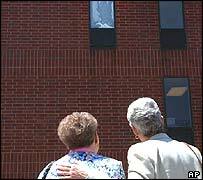 A US hospital has asked the Catholic Church for help after being swamped by thousands of people seeking to view what they believe is an image of the Virgin Mary in a third-floor window. More than 25,000 people visited the Milton Hospital near Boston, Massachusetts, at the weekend as word of the likeness began to spread. Attention is focused on a medical office building where the likeness is reportedly formed by a leaking chemical deposit inside a sealed window. The hospital has asked pilgrims to limit their visiting hours to between 1730 and 1830 local time, as it braces for another surge of visitors at the weekend. Hospital spokeswoman Susan Schepici said hospital officials had asked the Roman Catholic Archdiocese Boston for guidance on how to deal with the apparition and the ensuing crowds. 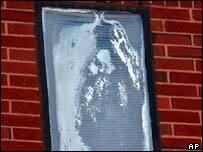 But the hospital's chairman, Richard Ward, was quoted by the Boston Globe newspaper denying that the Church had been asked to deflate interest in the window. "Obviously there has been a significant outpouring of sincere religious belief and I want to be sure the hospital doesn't do anything sacrilegious or in any way disrespectful to the Virgin Mary," he told the newspaper. Dozens of bouquets have been placed beneath the window. A large plastic container for money has also been set there. One hospital worker saw a mother bring her son, who uses a wheelchair, to touch the wall with his legs. At least five years have passed since a seal broke in the window, turning the glass a blotchy white, the Associated Press news agency reported. But it was only last week that the murky patches began taking a form that is said to resemble the Madonna. "It seems like every day it gets clearer," Sharon McGarty, an administrator in a doctor's office across the hall, told AP. "It used to look like just a dirty window." The Boston Globe reported that the crowds had made parking for staff and visitors extremely tight. The newspaper said the extra visitors had also made it hard for hospital cleaners to keep the grounds free of rubbish. But the hospital maintains that it does not consider the flood of visitors a "nuisance".